Katherine Hague is the Co-Founder of ShopLocket and The Blueprint, recently acquired by PCH International. 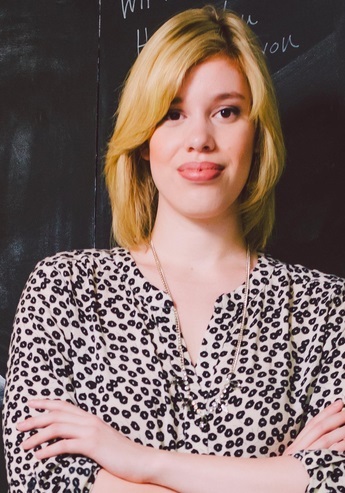 Prior to founding ShopLocket and The Blueprint Katherine worked as an independent digital media consultant and in a variety of marketing positions for Toronto startups; including a Shopify Theme developer and as Marketing Manager at ecobee, a smart thermostat company. Katherine helped started the Canadian Maker Passport, and worked the trade-show floor at CES many years running. I got into the tech industry as a teenager, by organizing entrepreneurial conferences. I later started my own marketing company and worked in marketing for a smart thermostat company. I got my start in e-commerce by creating a Shopify theme (at the time there were only 72 in the store, now there are 15,000+). This idea helped lead to the development of ShopLocket, an e-commerce tool that allowed you to start selling online in minutes, risk free. Tell us about The Blueprint. What inspired the idea and what is your vision for the company? TheBlueprint.com is an online retail destination and discovery platform for the next wave of consumer electronics. The Blueprint was born out of our acquisition by PCH International. We (ShopLocket) were acquired in January of 2014 with the intention of becoming the e-commerce and community arm for PCH International. Our vision for the company is to grow and become a well-known destination for consumers to learn about and purchase the latest tech to charge their life. What strategic partnerships have you implemented that have attributed to The Blueprint's success? Our partnership with our parent company PCH International has been instrumental to our success. Out of curiosity and interest, I took a solo trip to Shenzhen, China last fall to meet with Liam Casey, the founder of the organization. I originally found out about PCH International, at Montreal’s Startup Fest where I met Brady Forrest of Hwy1 (our startup incubator). We connected over our shared work with hardware entrepreneurs, and he later connected me with PCH International. We’ve also formed some incredible relationships with visionary hardware entrepreneurs and influencers (i.e. Chris Anderson, Dale Dougherty, Carl Bass, Limor Fried etc.) through our Blueprint interview series. This has helped us gain credibility in the space as well as create connections. I’m noticing a trend with connected devices and wearables being designed specifically for women. For example, we’ve seen the Tory Burch and FitBit partnership, and Angela Ahrendts (former CEO at Burberry) being hired at Apple as clear signs of changing times. One of our customers favourite products on our website is Ringly - bluetooth connected jewellery that lets your put your phone away and your mind at ease. We are capitalizing on this trend by connecting with women in this space like Deepa Sood, founder of Cuff.io and others for interviews, and choosing wearables to sell in our store that women would actually want to wear. "If today were the last day of my life, would I want to do what I am about to do today? And whenever the answer has been "no" for too many days in a row, I know I need to change something. Your greatest success as founder of The Blueprint? Most difficult moment-how did you overcome and what did you learn? Our greatest success has been our ability to build a global community of people interested in learning about the next wave of tech. We have over 160,000 community members from 88 countries who go to our social media channels, and subscribe to our email list to learn about the latest news and our insights on the industry. Our most difficult moment is finding the right way to communicate with our audience about the category of super early technology products that we stock. There is a big learning curve for consumers around new technologies and in order to combat this we have had to develop extremely rich content and details on the products we’re selling. My advice to aspiring entrepreneurs is to build your network before you need it. Start going to conferences and events, and meeting influential people before you need their help. This has been so helpful for me in hiring the right people, making key connections and building my company. I absolutely loved my trip to the Dell Women Entrepreneurship Conference in Istanbul a couple years ago. What an amazing city! If you’re going to Turkey, don’t miss Cappadocia as well. Water. It’s the good stuff. Besides growing a thriving company I’ve really gotten back into fitness and dance in the past few months! It has given me so much new energy. What's next for The Blueprint? Katherine launched ShopLocket in May 2012 and The Blueprint in 2014, and raised a $1 million seed round last summer led by Peter Thiel's Valar Ventures and Rho Canada. The Blueprint now provides thousands of hardware and product entrepreneurs a simpler solution for selling online. The company is dedicated to providing resources to the hardware community through its interview series and Crowdfunding Guide. Katherine is a graduate of the Schulich School of Business and HackerYou and was recently named one of Canada's 7 Tech Stars by the Financial Post, and one of 5 Women to Watch in Wearable Tech. Katherine is very active in the startup community and is committed helping other young entrepreneurs succeed. You can find Katherine online at katherinehague.com or on Twitter @katherinehague.